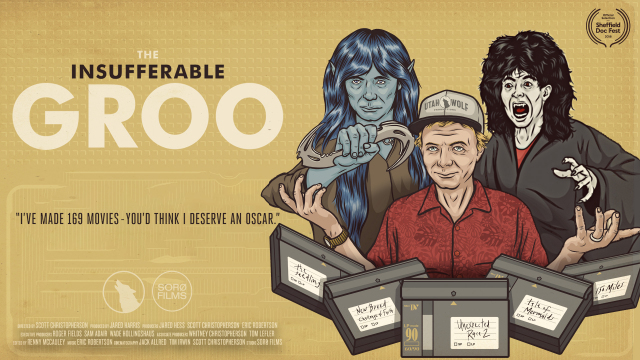 Stephen Groo is the world's most prolific filmmaker. In the past twenty years, he has made two hundred and five films, ranging from an elf/human love story to a low-budget remake of Tomb Raider. Yet Groo's obsession comes at a cost: he is yet to make a dime and his family barely has enough money to survive. But when, out of the blue, a major Hollywood star agrees to be in his latest film, Groo finally has his shot at fame and fortune. Stephen Groo, age forty, is a true American do-it-yourself film amateur. "I've made 169 movies", he proclaims, "you'd think I deserve an Oscar!" Groo's films range from fantasy epics, to romantic comedies and his eccentric style has won him a loyal Hollywood fan base including Jared Hess (director, Napoleon Dynamite), Jack Black, Jemaine Clement, and Mike White. But along with the adulation of a (very) small fanbase, has come a much larger crowd of trolls and haters. Devoted to filmmaking as he is, Groo has been largely unemployed during the past 12 years. He and his wife Sherry, and their four kids survive solely on Sherry’s income of $1,000 per month. Though Groo has never made a profit on any of his films, he’s determined to go for broke (again) and give it one last shot to produce his original elf/human love story film, The Unexpected Race. Will this final effort finally bring him the fame and fortune he's always dreamed of? Crucial to Groo’s plans is Hollywood A-Lister Jack Black, who Groo tries to woo in order to cast him as the sheriff in his title. With no permits, little money, and volunteer actors, Groo’s year-long production encounters problems that threaten to shut down the project on a daily basis. But in a surreal turn of events, Jack Black calls and agrees to be in Groo’s movie. Triumphant at last and more hopeful than ever, Groo drives to Los Angeles to film and direct Black as he plays a small-town sheriff trying to take down the rogue elf in The Unexpected Race. Yet finally having finished his masterpiece, Groo finds himself still seeking distribution and longing for the chance to make it big. For a Q&A with director Scott Christopherson and producer Jared Harris, scroll down to the end of the review here. Scott was one of ten doc filmmakers featured in Variety Magazine’s “Docu-makers to Watch” list in 2015. His debut feature film, Peace Officer, won both the Grand Jury and Audience Awards for best documentary at the SXSW Film Festival. Scott’s films have played at numerous festivals, including Hot Docs, Full Frame and Melbourne, and at the Museum of Modern Art in NY. Jared has always been interested in telling unique stories. After High School, he started Saint Cloud, a production company that specialises in original content ranging from documentary and narrative film to commercials and branded content. As an Executive Producer, Producer and Director, Jared has helmed over 100 commercials, a dozen short films and 3 feature films. Hess is a writer/director known for his films Napoleon Dynamite (2004) and Nacho Libre (2006), starring Jack Black. His newest film, Masterminds, was released in October 2016. 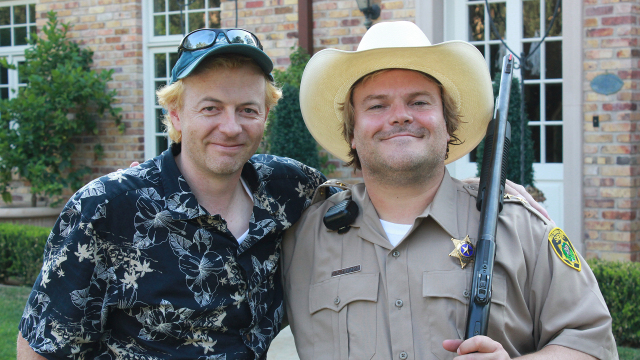 He became friends with Stephen Groo while studying film at BYU and gives Groo’s films as wrap gifts to his cast and crew, which is how Jack Black initially became a fan. I remember hearing about Stephen Groo when I was an undergrad in film school. He was a legend of sorts in my local community. When I entered film school I think he had already made 100 movies, and he even charged a small fee if you wanted to be the lead actor. I was fascinated by his work then but I didn’t have the confidence or knowledge to make a feature length doc yet. I returned to that same local community ten years later and finally met up with Steve. I knew I had to make a film about him. When I first met Steve he told me that a bunch of other people had tried to make docs on him over the past 15 years but they gave up. I didn’t know what to expect. Luckily I had an amazing crew and we spent countless 20 hour days following Steve. He can be extremely stubborn and insufferable, and he’s also very complex. Hopefully the film reflects the complexities of life choices and the effects of following one’s dream, no matter the cost.